Do I Need a Cleaning Service? Spring is definitely here, as demonstrated by the frequent rain, warmer temperatures, and floating pollen. Organic life is breaking through the cold of the winter months and populating on any surface it can find… including your home. If you’re like most people, you probably have planned spring cleaning. Most people do - it’s a time to get rid of the dust and dirt from being inside all the time. But what about the outside of your home? Spring is a great time to have the exterior of your house cleaned as well. Flowers aren’t the only thing populating during the spring – mold, mildew, and algae are making homes on your roof and siding RIGHT NOW. Go outside. Are there black streaks on your roof? Black and green streaks and spots on your siding? Say hello to mildew, mold, and algae, three of Agent Clean’s greatest enemies. These three parasites that cause black spots on siding and streaks on roofs are prolific and damaging. The algae on your roof can cut your roof’s life in half, and impede its efficiency. The black spots on your siding is eating away at the material. There are a few solutions. You could scrub it off. This is time consuming and difficult. You could blast it off with a hose. The problem is that water alone requires quite a bit of pressure to remove the mold, mildew and algae, and even if you blast it off with water, it will return in a few days time. You could pay someone to blast it off with water – not a terrible idea since they will have the pressure washer to do it – but then you risk damage to your siding or roof as high water pressure can easily tear through siding or strip shingles. Plus, the black spots would simply return after a few months. Why are mold, mildew and algae so hard to kill? They are spore-based organic parasites. 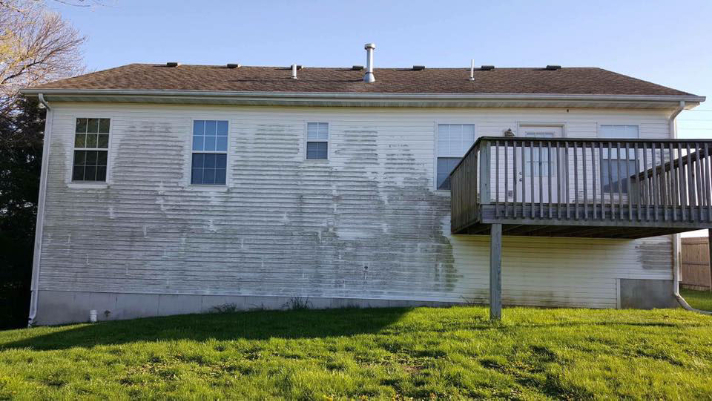 Even though the pressure washer has blasted the visible spots off the siding and the streaks off the roof, the spores are now in the air and looking for a moist surface to land on – which the pressure washer has just given them with your freshly washed siding and roof. In a few months, the mold, mildew and algae will be back. There is another solution – call Agent Clean. Unlike traditional power washers, we use a soft washing method to clean your siding and roof using low pressure water and a cleaning solution to gently wash the exterior of your home. We strive for a 100% kill ratio on mold, mildew and algae, and we achieve this all by using our state of the art equipment and techniques. Our technicians are well-trained, insured, and knowledgeable. We guarantee our work. Black and green growth on your home? No problem. Call Agent Clean today.